The food industry is a key sector of the French economy, which, according to the National Association of Food Industries (ANIA), generated revenues of EUR 180 billion in 2017, up 3.8% year-on-year. France is the sixth largest food exporter worldwide, with leading positions in segments such as wine, sugar, cheese, and poultry. The French food trade balance generated a EUR 7.5 billion surplus in 2017, up from 7.2 billion in 2016. France enjoys a worldwide reputation for the quality of its food products. 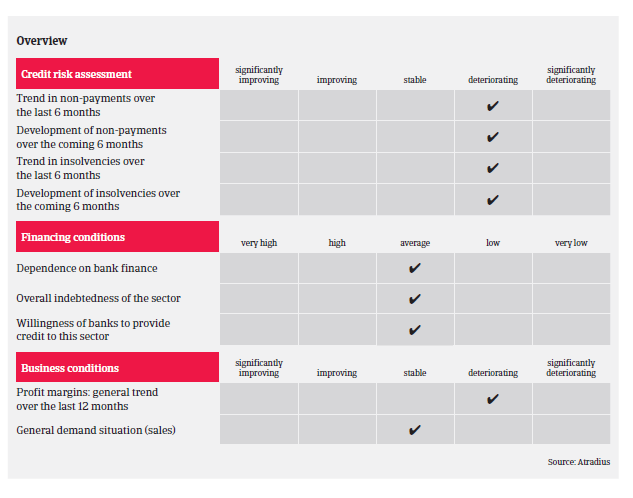 However, some structural weaknesses and challenges cast a shadow on the performance outlook. The increase in the trade balance surplus seen last year is mainly due to both price and volume increases in the beverage segment and higher sugar exports. Along segments, the current trade balance is only positive for beverages, dairy and grain. Excluding beverages there is even a food trade balance deficit, which increased by EUR 0.5 billion last year due to lower meat, fish, fruits, vegetables, animal and vegetable oil exports. The annual deficit for food trade within the EU is deteriorating further as French food processors, particularly in the meat industry, are losing domestic market share due to lack of competitiveness. This is highlighted by a 0.6% decrease in food production in 2017, followed by a 1.1% decrease in H1 of 2018. Increasingly volatile and rising commodity prices (e.g. for butter, milk or wheat) are a major challenge for French food processors. Many businesses in this segment struggle to pass on higher input prices, which is hampered by the high concentration and market power of retailers and strong competition from other companies within the EU. Margins of food processors have reached an all-time low in 2018, additionally impacted by high labour costs, higher taxation and stricter regulations compared to their foreign competitors. In summer 2017 the French government has initiated a mediation between producers/processors and retailers with a National Food Conference (Etats Généraux de l’Alimentation), resulting in new rules for annual price negotiations. However, most food manufacturers and syndicates already consider those rules insufficient. 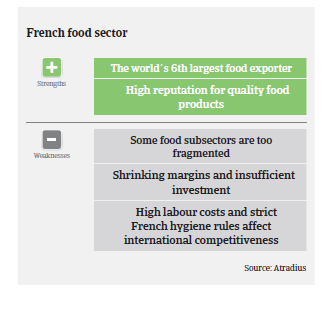 As a whole the French food industry still depends heavily on the domestic market, which accounts for 75% of revenues. 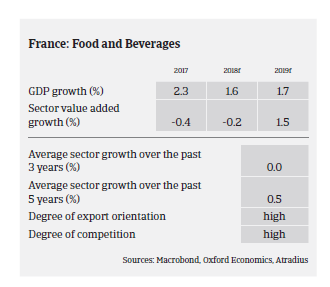 Beside the difficulties passing on price increases and losing market shares to foreign peers, French food businesses suffer from the fact that food consumption growth in France has slowed down. This is particularly affecting the dairy industry, as sales volumes of all dairy products have been decreasing over the past 18 months. In the meat sector consumption of bovine meats and ham is structurally declining due to health concerns and changing eating habits, while the growing demand for poultry is increasingly met by imports (mainly from Poland). Given all those difficulties and challenges it comes as no surprise that the portfolio payment experience has been rather bad over the past two years, and both payment delays and insolvencies have increased further in 2018, especially in the meat segment. Increased credit insurance claims both in terms of numbers and value indicate that the French food industry is currently no longer as resilient as it used to be. In 2019, we do not expect a significant rebound. Most problems are structural, and commodity price volatility has become commonplace as most tariff barriers have been abolished. Moreover, the current international trade disputes and Brexit create significant uncertainty for the French food industry (the food trade surplus with the UK amounted to EUR 5.3 billion in 2017, led by wines, spirits, and dairy products). 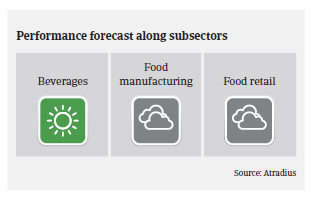 It is expected that profit margins of French food businesses will decrease further in 2019, while payment delays and insolvencies continue to increase. Therefore, we have increased our scrutiny on sensitive cases, with more responsive and firm actions for ‘grey zone’ companies that seem most vulnerable. Overall, we have adjusted our risk acceptance on the weaker segments (especially meat), but maintain a rather neutral underwriting stance on the whole industry. Fraud remains an issue in the French food sector, especially in the wholesale of meat. Fraud detection training for underwriters is a requirement to help them detect suspicious patterns.